The 1.5 kVA AC Resistance Welder offers many features and abilities. Advanced features include dual pulse, multi pulse, rollspot, resistance seam welding, and temper functions. The AC Spot Welders are computer controlled spot welders and include thermal protection monitoring. The 1.5 kVA AC Resistance Welder offers many features and abilities. Advanced features include dual pulse, multi pulse, rollspot, resistance seam welding, and temper functions. In addition, this AC resistance seam welding machine can save up to 100 schedules and up to 10 jobs (sequences of schedules chained together). 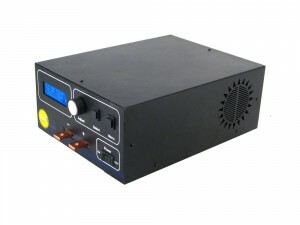 The 1.5 kVA Welder’s resistance seam welding function makes this unit one of our best sellers. The resistance seam welding function can be used for many resistance seam welding applications. More complex resistance seam welding can be accomplished when combined with the welder’s abilities to save schedules and jobs. These functions are possible due to a micro controller inside the unit. The AC1015 Spot Welders are computer controlled spot welders and include thermal protection monitoring.